Elderly Care Bartlett TN - Is Your Elderly Loved One Worried about Exercising? ← Do You Know How Low Vision Can Affect Safety for Seniors? 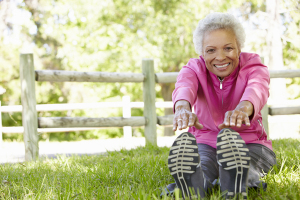 Is Your Elderly Loved One Worried about Exercising? Elderly Care Bartlett TN – Is Your Elderly Loved One Worried about Exercising? One of the biggest emotions your elderly loved one is likely to experience when she learns that she needs to start exercising is concern about the plan. That worry can keep her from exercising as much as she needs to and it might cause her to skip workouts altogether. When you’re first starting this exercise venture with your elderly loved one, it’s wise to start with a trip to her doctor. It’s also possible that your loved one’s doctor is the one who recommended that your loved one start exercising in the first place. He may have some specific suggestions as to what types of exercise are the best for her, so be sure to pay particular attention to those recommendations. Sometimes your elderly loved one might think that she has to really push herself in order to get results from her new exercise plan. That’s not true, however. In most cases, what your elderly loved one needs is simply to start moving more. If the choice is between doing a little bit of exercise or doing no exercise, a little bit is always better than nothing at all. Let your elderly loved one know that you’re proud of her efforts. Having even a little bit of positive affirmation can go a long way for your elderly loved one. She’ll grow stronger the more that she exercises, so any encouragement that you can offer will help her to overcome her worries. In turn, that helps her to exercise more frequently. It’s also important that you help your elderly loved one to keep her expectations in order when it comes to her exercise plan. Your loved one will see results, but it won’t be after her first or even her second workout. Let your loved one know that it’s all about the journey with this exercise plan instead of the destination or the final results. Having elderly care providers available can help your loved one feel comfortable enough to stick to her exercise plan even if you’re not able to be there. For Elderly Care Services in Bartlett TN, please contact the caring staff at Personal Care Services MidSouth today! This entry was posted in Elderly Care Bartlett TN, Exercise and tagged Elderly Care Bartlett TN. Bookmark the permalink.